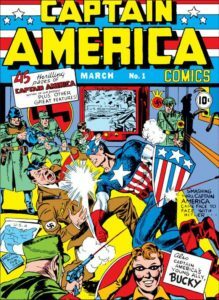 This year marks the 75th anniversary of Captain America, introduced in a Marvel comic punching Hitler in the face. Since then Cap’s popularity has only grown as his contributions to the Marvel Cinematic Universe (with Chris Evans in the iconic role) continue to bring in billions of dollars for Disney. 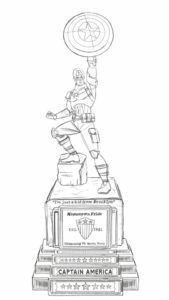 To celebrate the milestone (the birthday, not all that money, though we bet that helped), Marvel have produced a one ton bronze statue to celebrate the Captain that will make its debut at this years San Diego Comic-Con, and will then make a trek across the country, before settling in Steve Rogers original stomping grounds in Brooklyn (at least, according to the MCU). “For the past 75 years, Captain America has inspired generations of fans serving as the ultimate global icon for freedom, strength and doing the right thing,” says Paul Gitter, senior vice president of licensing for Marvel at Disney Consumer Products and Interactive Media. Fans can visit the statue when it debuts at SDCC (July 20-24), follow its progress across country through the various Marvel comics social media pages, or be there for the official dedication in Brooklyn’s Prospect Park on August 10th. And if that’s not good enough, you’ll have the chance to own your very own replica. Comicave Studios — who designed the statue alongside Marvel artists — will be selling 12-inch bronze replicas (limited to 750 pieces), and 35-inch pewter ones (up to 100, made to order).